The Next Web passes along a statement by the AGCM which claims Apple between March and November continued to infringe on rights covering “Legal guarantee of conformity and commercial guarantees for consumer goods” in the Italian consumer code. This is despite Apple updating its warranty policies November 10 in response to the warranty shenanigans. In light of the above considerations, it was determined that Apple’s behavior during the period of 28th March 2012 – 10th November 2012 constitutes non-compliance with resolution no. 23155 of 21st December 2011, as modified by resolution no. 23193 of 11th January 2012. 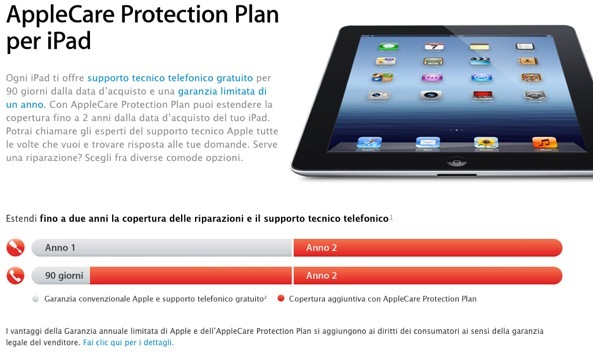 Cupertino is being accused of selling its $99 a year AppleCare coverage even though a two-year warranty is mandated by the European Union. Furthermore, Apple’s warranty covers only its products, while EU consumer protection laws require sellers to provide coverage for both first- and third-party products.